Please park your City Water Truck in the correct spot, not the TV News Parking. Friday November 19, 2010 was not a good day for Chicago’s big shot T.V. stars. One news celebrity was in court after speaking his mind to another reporter. 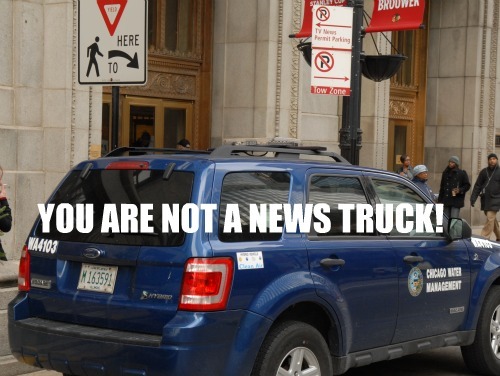 I was very upset when I was at Chicago’s City Hall and found Chicago Sun-Times newspaper megastar Mark Brown’s non caring attitude towards a Chicago Department of Water Management employee’s careless parking in the reserved TV news section. I understand Mark Brown may be on a big story, but he should stand up to Water Department brass sneaking these prime parking spots. You should have special reserved parking permits in your window. These are obtained under scrutiny by the Chicago Police Department. Note to all employees, the Jardine plant has a van to bring you back and forth to City Hall. Let’s stop receiving unneeded attention from Chicago’s media. Photo by Patrick McDonough. Previous PostPrevious Alderman Robert Fioretti guest on Chicago Clout with Ivan Tomic, host. Next PostNext 48Th Ward Candidates step forward at last, time to debate NOW!